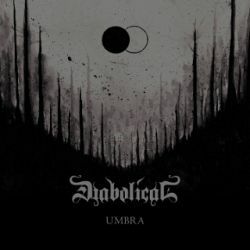 I’ve been spinning Diabolical Umbra in my player for some time now, and I’ve been thinking to myself: “it’s scary how many freaking metal bands exist in Stockholm, Sweden”. Umbra is a four-track EP that the band put out at the end of last year, and I’m quite content that it ended up in my hands because it strikes all the right notes for me. EP lasts only about 22 minutes but there is so much going on that I don’t think anybody can spin this thing just once; so technically, it becomes way longer than it actually is. Knowing Sverker Widgren vocals from Centinex and Demonical I was instantly sold on this album. His deep tone growl/roar is, was and probably will be one of my favorite sounds delivered by throat operators in death metal. Not too many dudes out there can pull off sounds like that and be able to talk afterwards. ‘Requiem’ is the first track, and a good one at that, to start the attack. Full of eerie elements created by the choir arrangements, disconsolate guitar melody and ominous atmosphere, and yet with death metal aggression and just the right speed. Diabolical uses the symphonic elements to enhance the grandiosity of their art, and the choir I mentioned is actually a 9-person ensemble made of actual artists - not some studio keyboard trickery. It makes a huge difference and improves the whole experience quite tremendously. ‘Diaspora’ comes second and this one is more in death metal category but with doom section that builds atmosphere with once again great guitar melody and slower tempo combined with clean guitars. This is the ideal track to slow down the aural assault and introduce truly atmospheric track ‘Tremor’ containing excerpts from Jiddu Krishnamurti “Talks On Fear”. Through the whole song we have a man speaking about fear and consequences of fear in a manner reminding of instructional video or program. This song feels like a nice ballad with a dark melody and slow guitar playing with clean singing in the background, but listening to the actual lyrics can put anyone in a very uneasy state of mind. ’Decline’, a fourth track, brings back the death metal to the forefront but yet again there is a slow moody section in the middle. Riffs are quite complex and pummeling on this one - but combined with the sadness of guitar melodies and scattered rhythm changes - leave you wanting more and with the feeling of something being unfinished. Here is when you press ‘play’ again. Umbra feels like a compilation of songs that won’t exactly fit into the next Diabolical album but it could also be a taste of what’s coming. Hard to say knowing what the band was doing on their previous albums, but one thing is for certain - this short EP brings all kinds of emotions out of a listener and if you decide to pick it up, get yourself ready to discover all the subtle nuances this material will concede; and also for many repeat listen sessions that will follow.